One Small Thing will be available June 26, 2018. After a number of so-so reading experiences lately, I really needed an Erin Watt book. This duo’s writing is always so addicting and One Small Thing was no exception. It says in the synopsis that Chase played a part in Beth’s sister’s death and I think it’s pretty obvious what that is. It doesn’t take long for the book to reveal it, either, but I’ll still try not to spoil it. I have to admit that this particular kind of trope is usually not one I go for. However, it worked for me here. I liked the conversations it brought it up. How differently people grieve. How people move on. How people judge. The topic of forgiveness. There was a lot more depth to this book than I expected there to be. Though some of Beth’s behavior drove me a little crazy, I did find her a likable character. I wish she was more honest and she definitely made a lot of misguided decisions, but once she realized how poorly she was behaving she took steps to change it. And I loved Chase. I just loved him. I know he has some pretty obvious flaws, but I still thought he was pretty perfect. He was just so sweet and smart and a little tortured. I definitely shipped them and their moments together were my favorites of the book. 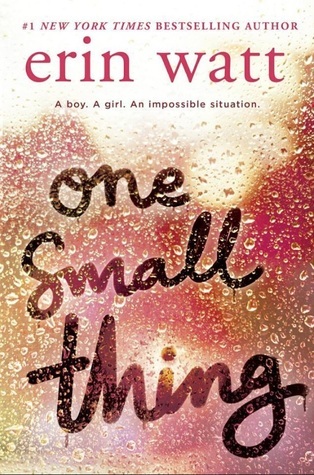 Overall, I really enjoyed One Small Thing. Though it was a little heavier than I was expecting, I thought it had a good message. I liked the main characters (especially Chase) and the romance. I did find everything to be just a little too predictable, though. Pretty much every development I guessed far ahead of time, so even though the writing was addictive and kept me turning the pages, the plot itself seemed a little drawn out and then things wrapped up very quickly at the end. However, the positive message and my love for Chase makes up for those aspects for me. I heard a lot of things about this book. I’m looking forward to reading it! I really enjoyed it! I hope you do, too! I loved the blurb of this book. I badly want it! I requested the book from Netgalley but I never got it! LOL… I will definitely pick it up once this gets published! If you join their Facebook page they usually post a sign up link where you can request an ARC and then they give it out via NetGalley. I’m not sure if they actually approve people who request via NetGalley alone?? But, anyways, I hope that you enjoy it as much as I did! I didn’t really know that. I will try requesting through the facebook page next time. thanks for the advice. I love this review! I felt a lot of the things you did with this one. He definitely raised my overall rating a bit. I just love him so much! We should start a Chase club!!!! I’m in the mood for a book like this. I have to jump on to Net Galley soon and see what’s available! Thanks for reviewing! I hope you find something just as addictive and enjoyable as I found this!